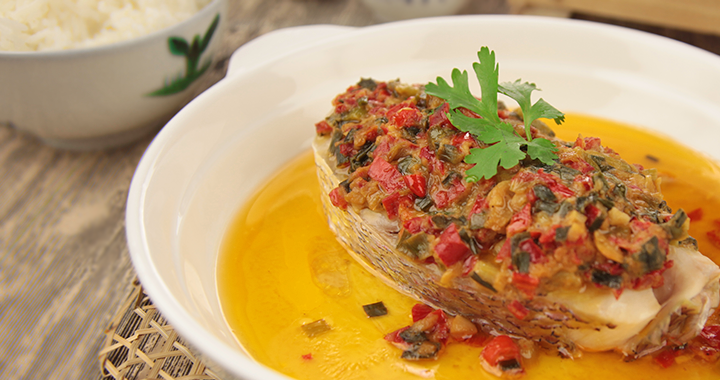 Steamed fish is one of the most common home-cooked dishes in Chinese family, especially so for Teochew and Hokkien. It's simple to cook and healthy to eat. This week we have Diana Gale, an award-winning blogger @ domesticgoddesswannabe, sharing with us her very own Steamed Fish with Miso recipe. We were surprised by the addition of Miso as it deepens the taste and it goes really well with rice. Last but not least, steaming is one of the healthiest cooking method. It locks in the nutrients so that you can have it all. Wait no more! Give this recipe a shot! This week we have Diana Gale, an award-winning blogger who is sharing with us her very own Steamed Fish with Miso recipe. We were surprised by the addition of Miso as it deepens the taste and it goes really well with rice. In a heated pan with olive oil, add in garlic, chilli, ginger juice. Stir fry until fragrant. Add spring onion, miso and pepper. Cook for 2 mins on low heat, until the sauce thickens. Pour the sauce over the fish. 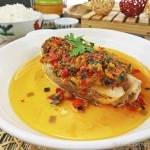 Place the fish in a hot steamer, steam it for about 10 – 15 minutes. Cooking duration depends on size and thickness of fish fillet.